Crowns are a type of dental restoration which, when cemented into place, fully cover the portion of a tooth that lies at and above the gum line. In comparison, fillings are dental restorations that fill in or cover over just a portion of a tooth. Since dental crowns encase the entire visible aspect of a tooth, a dental crown in effect becomes the tooth's new outer surface. Crowns can be made out of porcelain, metal (gold or other metal alloy), or a combination of both. When accidental damage has occurred resulting in lost teeth, or where teeth have broken away through excessive wear, crowns can be used as a long term solution. In teeth with root canal fillings, crowns can prevent these teeth from breaking. These treatments are used for a long lasting correction of major dental problems. 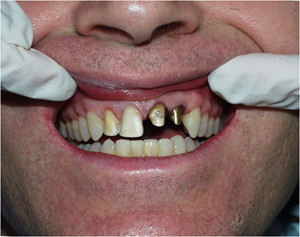 It is usual for these treatments to last for 20 - 30 years, which is as close to permanent as dental treatment can get. Since a dental crown that has been cemented into place essentially becomes the new outer surface for the tooth, it is easy to imagine how the placement of a crown can restore a tooth to its original shape. It's also easy to see how a dental crown can help to strengthen a tooth by way of being a hard outer shell that encases the tooth structure that lies within it. For both of these reasons, dental crowns are routinely made for teeth that have broken, worn excessively, or else have had large portions destroyed by tooth decay. 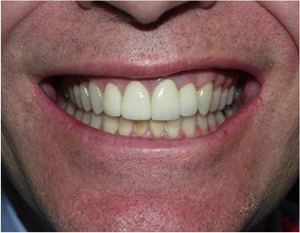 We now also utilize a CEREC system which allows us to complete the crown process in only one visit! Traditionally, fitting a crown requires two visits to our office. During the first visit, we will remove decay, shape the tooth, and fit it with a temporary crown made of either plastic or metal. On the subsequent visit we will remove the temporary crown, fit and adjust the final crown, and cement the crown into place. Can Dental Crowns Be Used To Improve The Appearance Of My Smile? Since a dental crown will encase the visible portion of a decayed tooth, any dental crown that has a porcelain surface can be used as a means to improve the cosmetic appearance of a tooth. However, dental crowns are best utilized as a way to improve the cosmetic appearance of a tooth when the crown also simultaneously serves other purposes, such as restoring a tooth to its original shape or strengthening a tooth. In general, a crown should not be used as a means to improve the appearance of a tooth if there is any other alternative dental treatment that could satisfactorily achieve the same cosmetic results. This is because a dentist must grind a significant portion of a tooth away when a dental crown is made. If a more conservative dental procedure could equally well improve the tooth's appearance, such as a porcelain veneer, then it is usually best to consider that treatment option first.